Hanoi (VNA) – President of the Vietnam Fatherland Front (VFF) Central Committee Nguyen Thien Nhan hosted a reception for Professor Alexander Hemprich, President of the Germany-Vietnam Medical Support Association (DEVIEMED), in Hanoi on March 25. At the meeting, the VFF leader thanked the association’s professors and doctors for their contributions to the Vietnamese health care sector over the past two decades, pledging to facilitate their charitable activities in the Southeast Asian nation. According to Alexander Hemprich, over the past six years his association has supported the building of a jaw and face centre in the Da Nang Orthopedics and Rehabilitation Hospital. 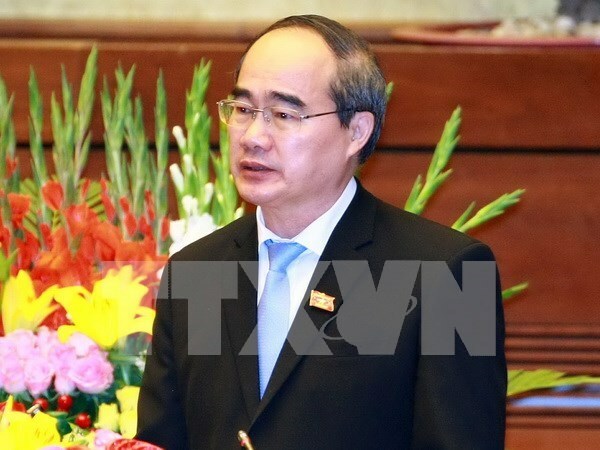 The professor noted his hope that the VFF and the Vietnamese Ministry of Health will join hands with his association to provide more aid for disadvantaged people in not only the central city of Da Nang , but other cities and provinces across the country. As a non-governmental organisation of Germany , DEVIEMED is staffed by leading professors, doctors and surgeons majoring in dental, jaw, facial, ear, nose and throat medicine, among others. It aims to conduct free surgeries for underprivileged children, especially those from ethnic minority groups, born with harelips, cleft palates and other facial deformities.